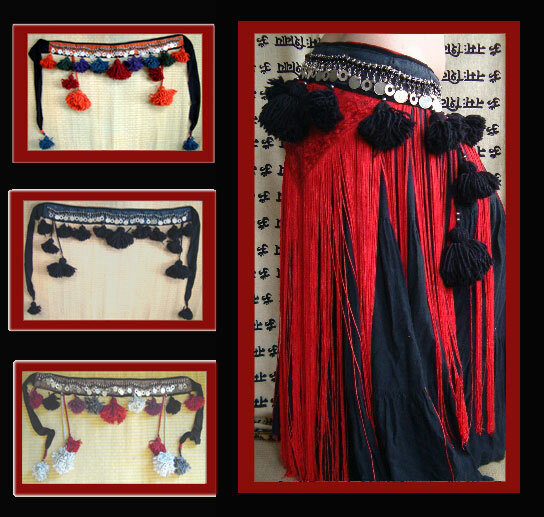 An exquisite belt for spins, bumps, and shimmies, 100% wool tassels, hand made by Gwen, replica Raj era coins, with glass and pewter bead detail. 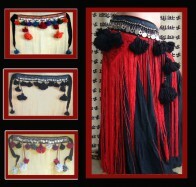 I made this with layering in mind, the picture shows it over the long fringe mirror belt. Lapis Blue; (top picture) cobalt blue beads set off the pewter toned raj coins against lapis blue brocade. the tassels are shades of lapis blue and turquoise, accented with fushsia, ruby and marigold! Village Amber; click here for picture Amber glass beads and raj coins set against a belt of rust brocade. The tassels are tawny and dusky village hues; complimenting rusts, olives, teals and burgundies. SOLD OUT! Garnet click here for picture, and another! ; garnet (deep red) glass beads and pewter coins set against subtlety patterned Jacquard brocade click here for detail, wool tassels in tones of deep red, garnet, pewter, silver and black. Black on Black; black glass beads set off the pewter toned raj coins, backed with black brocade, and finished with black wool tassels detailed with pewter beads. Handcrafted after I receive your order.